Bree from The Cake That Ate Paris really is an artist. I was so lucky to have her create my wedding cake. Not only did it look spectacular, it tasted even better (even a year after being in the freezer). I had a chit chat with Bree to get her advice on how to choose the perfect wedding cake for your day! What is your favourite cake or dessert? Tiramisu... It has to be a good traditional one though!! What cake did you have at your wedding? I made my own cake, it was a 4 tier fondant covered cake with cascading sugar flowers. Inside was dark and white chocolate layered mud for the bottom tier, raspberry butter cream for the 2nd tier, apple spice cake for the 3rd tier and chocolate mint mud cake for the top. What does the cutting of the cake mean to you? We get to eat cake!!! I know it should mean something much more traditional but I think it is just about cutting into your dream cake (with your new hubby!) and getting to eat it! How do you know how much cake you need for guest numbers? Is there a rile of thumb? Generally, my 2 tier feeds 60 people, a 3 tier feeds 80 people and a 4 tier cake feeds 100 people. Chat to your decorator about sizes as there are so manly different sizes and every decorator probably does it a bit differently. 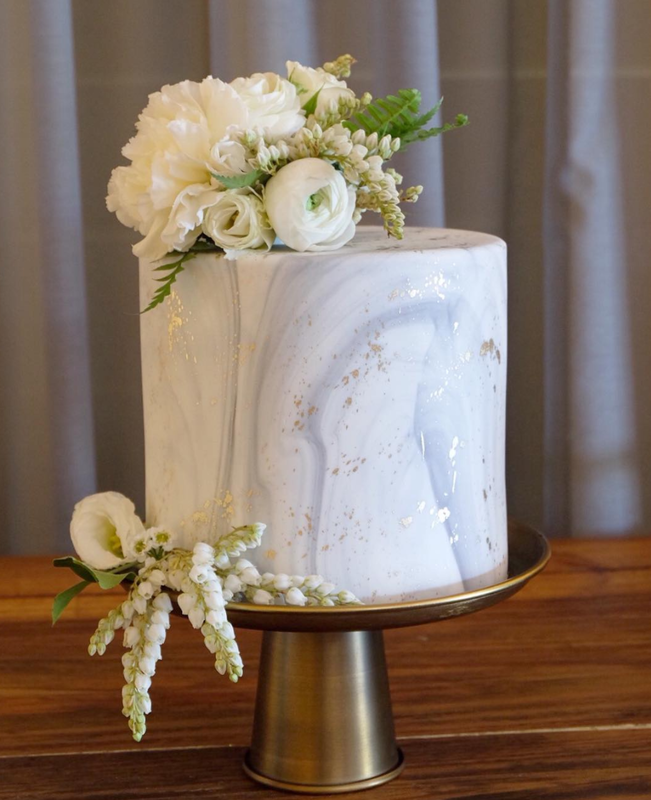 What is the process you have for brides choosing their wedding cake? I usually receive emails from brides outlining their date of wedding, how many people the cake needs to feed and any design ideas they have in mind. I give them a rough idea of price through email and if they are happy to go ahead we arrange a consult and tasting to go through things in more detail. If you had to choose your wedding cake right now, what flavour would it be? Hmmmm... Banana with caramel butter cream or my apple cinnamon cake with caramel butter cream. What new trend will you be happy to see the back of? What cake trends do you foresee for 2017? Probably lots more 'naked' cakes.. But I would like them to get a bit more extravagant! Probably lots more 'naked' cakes...but I'd like to see them get a bit more extravagant!